As Partners to Plastics SA Clean-Up & Recycle SA, Engen was recently invited to attend a beach clean-up on Robben Island. Engen, who are a supplier of polymer material to the plastics industry, along with 140 volunteers and partners assembled at the Nelson Mandela Gateway early on Saturday, 17 September and joined other project partners, including The Nelson Mandela Foundation, Brand SA and the Department of Environment and Tourism. International coastal clean-ups have grown out of a single event in 1986, where a woman walking along a beach in Texas was appalled at the amount of litter she saw. In a mere two hours she organised 2 800 Texans who collected 124 tons of litter. Little did she know that her efforts would gain the attention of the world and inspire a worldwide programme. Thirty years on, more than 700 000 volunteers in 127 countries participate on the third Saturday in September each year. Engen’s Corporate Affairs Manager, Tasneem Sulaiman-Bray says that while plastic is an essential part of our lives, and contributes positively to our lifestyles, pollution caused by discarded plastic is a cause for concern. “It’s a major problem in cities, the countryside and on beaches throughout South Africa. Engen is keenly aware that by working together we can help educate our nation on the benefits of recycling plastic, and increase the awareness of environmental protection and stewardship,” says Sulaiman-Bray. 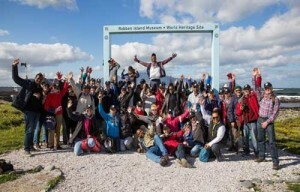 Once the day was done, the coastal clean-up volunteers returned from the iconic island to dry land, tired but satisfied to have done their bit to protect what is precious to us, and to have shared in a duty that contributes so positively to our national good and the good of our world.